Ronald Says - memoirs of a music addict: Soundgarden reunion? So this week there were rumours about an upcoming Soundgarden reunion. Although a bit vague: "I talked to this guy and he knows people and they..." could it be true? Several sources reported this rumour where all previous members of Soundgarden including Chris Cornell supposingly were talking about a reunion next year. They were all referring to a Kerrang! magazine article that mentioned Shinedown singer Brent Smith talking about it. They sure had me hoping for a while. 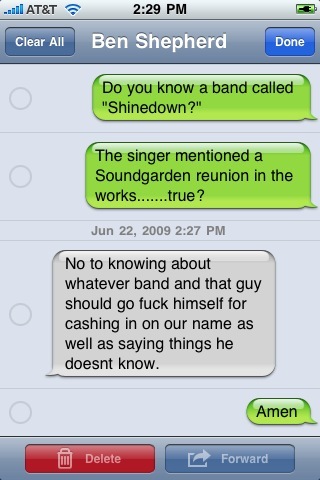 I sure would like to see Soundgarden coming back together. Maybe where there's smoke there's a fire? I guess time will tell. Wouldn't you like to see this reunion? Let me know what you think and leave a comment.